Output is by default in the hCalendar microformat. 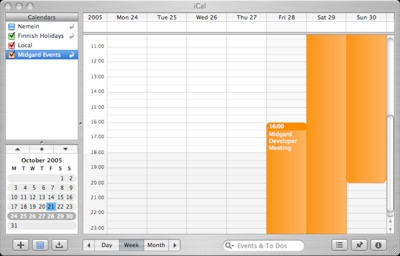 The calendar uses the OpenPsa Calendar libraries to provide its features. This means that it is easy to add new capabilities like publish/subscribe webcal feeds and SyncML as we go. I’ve deployed the new calendar for Midgard events. Converting events from de.linkm.events to the new format was done with a simple PHP script. Prior to running this script inside a Midgard style I installed OpenPsa and the latest net.nemein.calendar.